The title says it all. 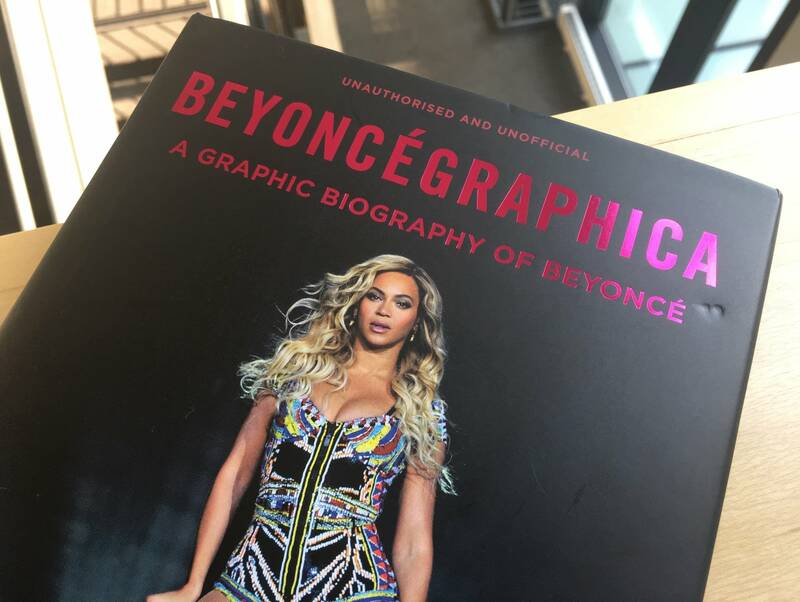 Beyoncégraphica is a "graphic biography" of Beyoncé. That doesn't mean it's particularly explicit or shocking in its content — though the cover makes clear that it's "unauthorised and unofficial," author Chris Roberts is no Kitty Kelley. 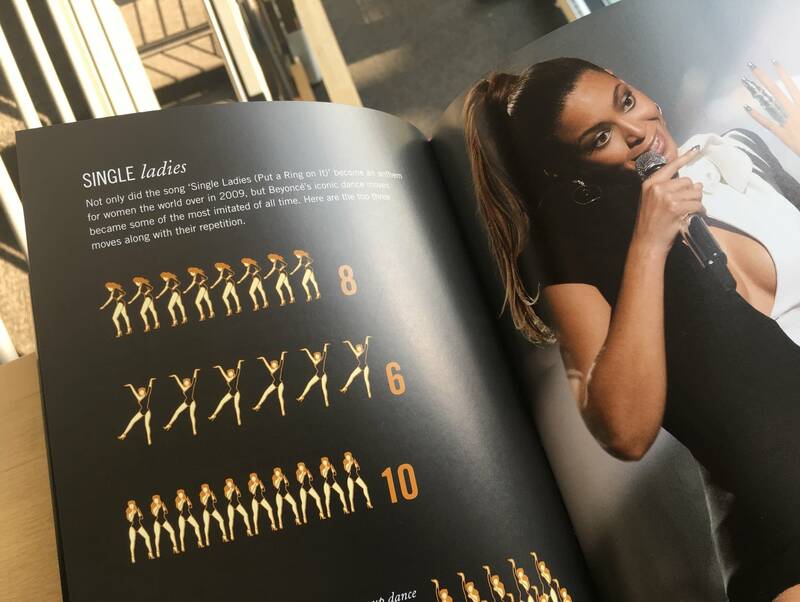 Rather, that means that it's a Beyoncé biography with infographics. What's there to visualize? (Or, as the London-based Roberts might write, visualise?) What isn't there to visualize? Charts in Beyoncégraphica include comparative diva heights (ranging from the 5'0" Ariana Grande to the 5'11" Taylor Swift, with Bey right in the middle at 5'6.5"), a "Bootylicious" word breakdown (the song has 23 instances of "jelly," but only one instance of "vibealicious"), and a tally of "Single Ladies" dance moves (ten strut-claps, eight step-punches). One spread illustrates Beyoncé’s backstage requirements, including a white chaise lounge and two bars of Irish Spring. Some of the visual analysis is more substantive. 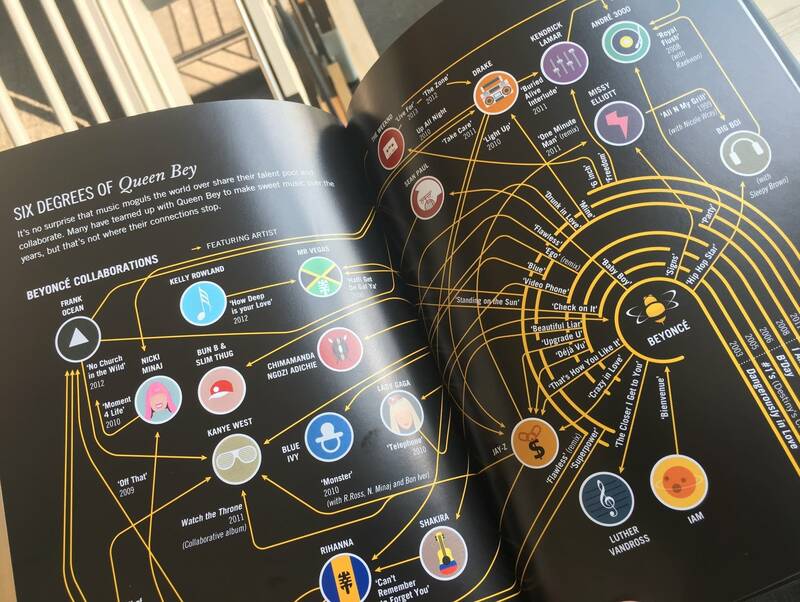 A map of Beyoncé collaborators connects the dots from the Queen Bey to JAY-Z to Kanye to Rihanna to Shakira and back again. 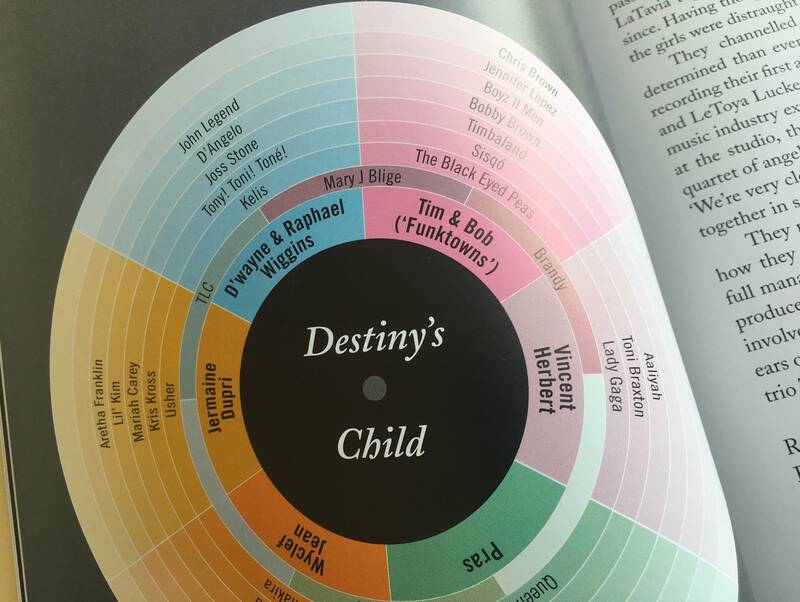 A map of Destiny's Child producers shows how Beyoncé’s band share influences with everyone from 2Pac to Simply Red. Maybe the most fascinating is a map of female pop stars' vocal ranges, with Beyoncé’s A2-E6 range dwarfing the G2-B5 range of Aretha Franklin but taking a back seat to Mariah Carey's astounding F2-G7 range. Beyoncégraphica won't gather dust on your coffee table, whether or not you feel the need to read its 256-page text from cover to cover. It's a serviceable overview of Beyoncé’s career, from the infamous 1993 Star Search loss by her youthful group Girls Tyme to her triumphant Lemonade tour. Members of the Beyhive will find nothing to take offense at, except perhaps the infographic clarifying that they are, in fact, outnumbered by the world's actual bee population of 6.5 billion. Given that Roberts relied on published sources for his information, there are no brand-new revelations here — but for the fan, like me, whose previous knowledge of Beyoncé’s early life came largely from the "Grown Woman" video, there's plenty of useful background. I learned, for example, that Beyoncé’s name was adapted from her mother's maiden name, Beyincé — and, thanks to a baby-bottle infographic, that "Beyoncé" peaked in popularity as a baby name in 2001, when Destiny's Child were wildly popular but their lead singer hadn't yet become a global icon. I also learned that the alter ego "Sasha Fierce" was originally a childhood nickname bestowed by Beyoncé’s cousin to help the young singer overcome stage fright. 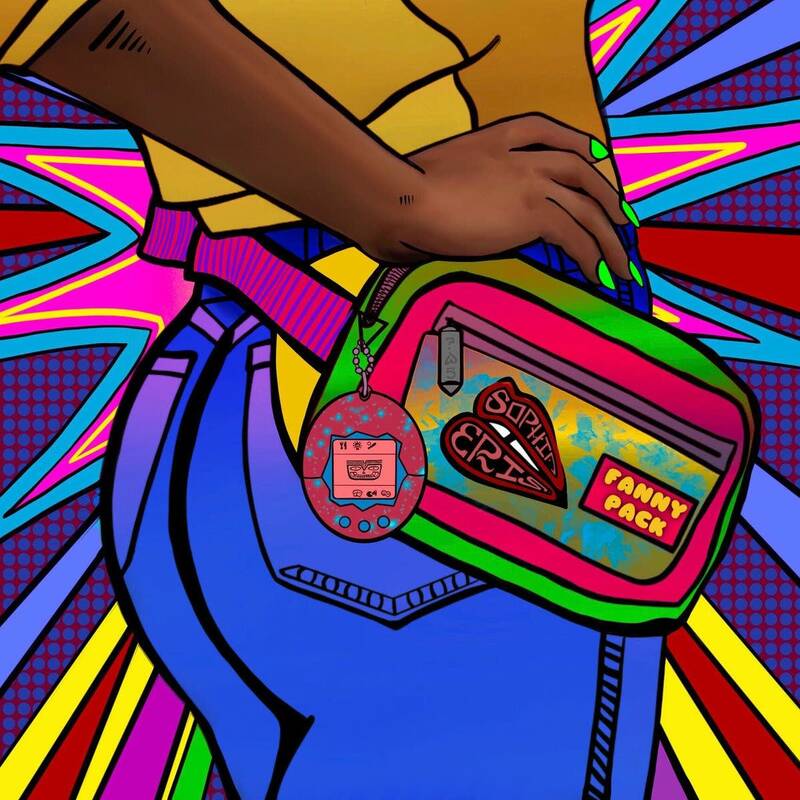 While the book catalogs — in, yes, graphic detail — Beyoncé’s many achievements, it also makes clear that from the beginning, she's gravitated toward collaborating with top talents who will challenge her as an artist. It's not by accident that Beyoncé has been at the center of the pop R&B universe for two decades; though she keeps her own personal life private (at least, until the concept album drops), she's a generously collaborative musician and public figure. Beyoncégraphica is a fun look at the remarkable career of an artist who Roberts calls, justifiably, "popular entertainment's biggest icon of the twenty-first century." It's humbling to look through the book and reflect on the fact that, as the inspirational coffee mugs put it, you have as many hours in a day as Beyoncé does.